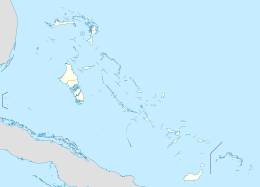 Walker's Cay is the northernmost island in the Bahamas, part of the North Abaco district. Once a popular sport fishing location, the island has been deserted since 2004, following severe hurricane damage. Walker's Cay lies 53 miles (85 km) to the northeast of West End, Grand Bahama, in the northern Bahamas. Its surface is only about 100 acres (40 ha). The island sits on the edge of the Little Bahama Bank, the bank containing shallow, green-colored water, averaging about 10 feet (3.0 m) in depth. However, on the north side of Walker's Cay, the water drops off sharply into deep blue ocean depths. The closest island is Grand Cay. Walker's Cay was named after Thomas Walker, a British judge exiled on the island in the early 1700s. After his death in 1721, the island remained uninhabited for over two hundred years, until Buzz Shonnard, a businessman from Palm Beach, Florida, leased the land from the Bahamian government in 1935 and built a small hotel, attracting anglers and tourists to the island. A 75-slip marina was built, and an airstrip, Walker's Cay Airport, with a 2,500-foot-long (760 m) runway suitable for light aircraft. Shonnard had connections with affluent American sport fishermen of the 1930s and promoted Walker's Cay as a location for billfishing. Blue marlin in excess of 500 pounds (230 kg) have been caught off Walker's Cay. During World War II, Walker's Cay was used by the U.S. Military as an anti-submarine base, since its airstrip allowed aircraft to patrol the waters near the southeast Florida coast. One of Walker's Cay's seasonal residents was American businessman Robert Abplanalp, the inventor of modern-day aerosol valve for spray cans. Abplanalp bought the lease on the island in 1968 and continued to develop it as a sport fishing destination, while paying attention at the same time to the conservation of the island. Various celebrities became regular visitors of Walker's Cay, such as US President Richard Nixon, actress Jane Fonda, singer Roger Daltrey and athletes like Davey Johnson and Roger Staubach. The Walker's Cay marine area was declared a national park in 2002. Abplanalp died in 2003, and the following year the island's fortunes were dealt a further blow, when two severe hurricanes, Frances and Jeanne, destroyed the hotel and severely damaged the marina, the hotel was not rebuilt. Despite some expressions of interest from US investors to purchase the island and revive it, Walker's Cay remains essentially deserted. ^ a b Waters, Steve (June 5, 1992). "It Begins With A Cay". Sun Sentinel. Retrieved 20 April 2016. ^ Waters, Steve (July 26, 1992). "There's nothing to do on the island of Walker's Cay but fish, dive and relax". The Baltimore Sun. Retrieved 20 April 2016. ^ "Walkers Cay marine park" (PDF). Currents: Newsletter of the Bahamas National Trust. June 2002. p. 4. Retrieved 2009-03-09. ^ Hartnell, Neil (20 Aug 2014). "Us Billionaire In Walker'S Cay Talks". Tribune242. Ellington. Retrieved 16 April 2016. ^ Fusco, Mark (20 Nov 2014). "Bahamas Hopes To Sell Walker's Cay To U.S. Billionaire". PassageMaker. Annapolis, MD: Cruz Bay Publishing. Retrieved 16 Apr 2016. ^ Robards, Chester (22 May 2018). "Walker's Cay sold, earmarked for development". The Nassau Guardian. Retrieved 22 May 2018. This page was last edited on 19 November 2018, at 20:49 (UTC).